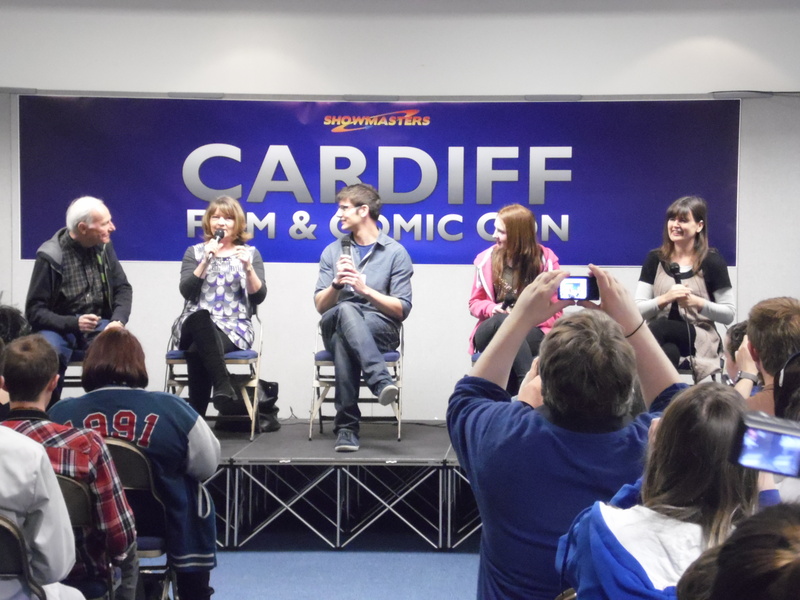 The Cardiff Film and Comic Con or Eve Myles steals the show…. 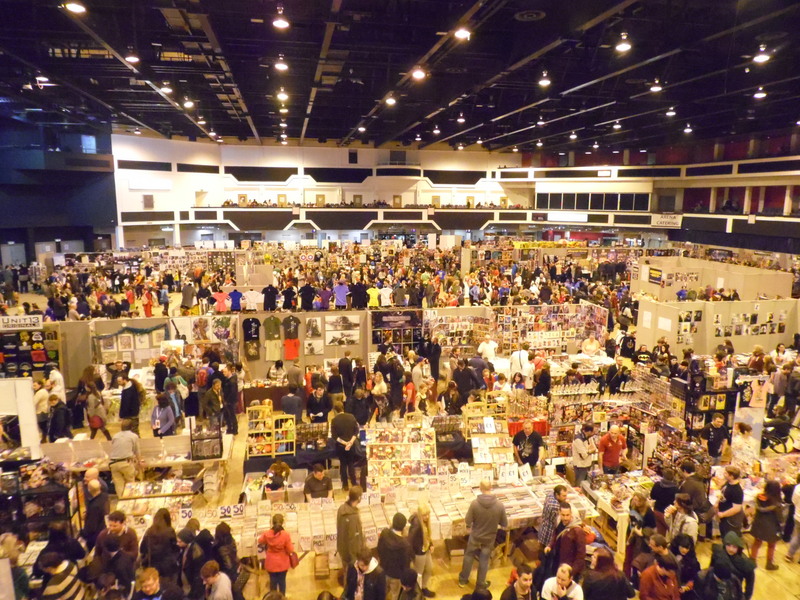 The Cardiff Film and Comic Con was held at the Motorpoint Arena on Saturday 1st & Sunday 2nd March 2014. The event promised to build upon the success of the previous Cardiff Film and Comic Con in 2013. The event brought together the stars from TV, Film and Comics as well as a whole host of fun activities including photo shoots with the stars, panels, autograph sessions and hundreds of stalls full of TV and Film Memorabilia. This was the second time this event had been held in Cardiff but my first attending. Having once lived in South Wales for a number of years it was really great to see something of this nature being held for the fans. This was also my first convention where I would be going on my own; that seemed quite daunting but on the other hand quite liberating since I would only be working to my own timetable and not by particular groups. Having left London quite early on the Saturday morning I actually bumped into some Doctor Who fans dressed as the Tenth and Eleventh Doctors at Paddington Station. They were looking forward to the event and passersby weren’t even taking a second look. Perhaps an indication of how popular Doctor Who is again or how Londoners are used to seeing people dressed in bow ties and waving sonic screwdrivers? While on the train I was wondering how Show Masters would adapt the venue to fit its convention model of signing areas, stalls, comic areas, help points etc. I have been to the Motorpoint arena quite a few times before for concerts and while being a good size it was nothing like Earls Court in London. I was also wondering how many people would be attending, would it be manic or quite relaxed? I arrived at the arena to find queues around the block! This was brilliant; not only for Show Masters but for the people of Cardiff and Wales. I am a big fan of Wales and it was wonderful to see so many people wanting to get into the event and all those who had made the effort to Cosplay. As always over the weekend there were some wonderful costumes, accessories. The first thing you see when you enter the arena is the Batmobile! Holy-jaw dropping…. The Batman series of the 60’s was one of my favourites growing up as a boy and the iconic Batmobile will always be a reminder of my childhood. Even now I still have my Dinky toy that fired missiles from the back. The car looked wonderful. My only regret is that there was not an opportunity for a photo shoot inside the car. Perhaps one day I will get to sit inside and say those magic words of “Atomic batteries to power. Turbines to speed”. I do like that at each event Show Masters try to have a “show piece” near the front entrance. Once I had my press pass I was ready to explore the arena and I have to say that I was impressed with the layout of the event. There were signing areas at the top of the arena by the main stage and another block just a few meters away from there. Around the sides were the stalls, comic areas (which were also split on both sides) and a Cosplay area and help desk / sales area. It was at this point I was asking myself where the talk areas were. Instead of cramping everything in on the main floor the decision was made to have the talks / photo shoots / games area upstairs. This really worked since you would be able to hear the talks without any distractions or the “din” of the event like you do at Earls Court or Olympia. 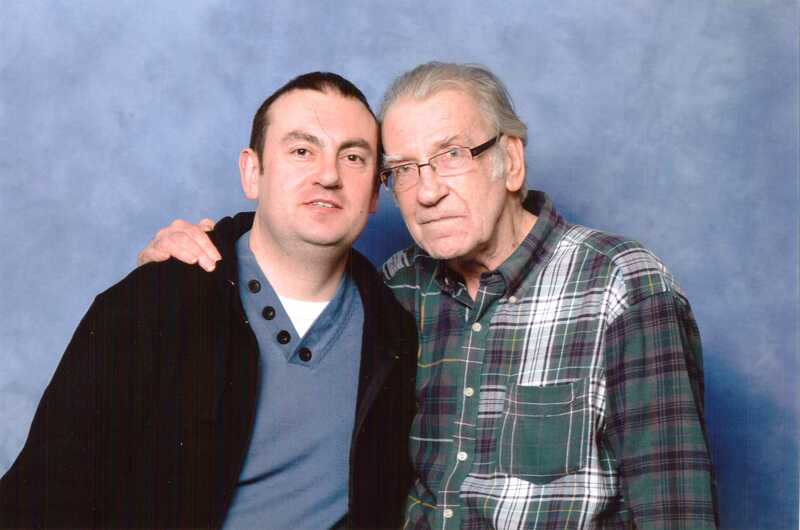 My aim for Saturday was to attend the Stargate talk with Christopher Judge and Suanne Braun, the talk from David Warner , to meet Lee Meriwether and to have a photo shoot with David Warner and to get his autograph. While being a big Trek fan it was nice to move away from the final frontier and look at other franchises and actors / actresses. I found the Stargate talk really enjoyable. While I am not a big SG1 fan (I prefer Atlantis) I did enjoy the antidotes that Chris and Suanne were telling us. They both spoke about how they got the parts on the series, how great it was to work with Richard Dean Anderson and how popular the series was. Suanne spoke about how on a trip to Israel she was having her bags checked and there seemed to be a problem until she was able to explain she had been on Stargate while Chris mentioned a scary trip in Paris where a group of school kids recognised him while out with his family and with the help of social media the amount of kids grew exponentially. The story that made me chuckle the most was how Chris when enjoying the night life of Vancouver fell asleep one day while filming. When questioned by the director Chris was outraged that he could think such a thing. Chris was merely medicating, something that Teal’c would have done. The director “brought” this and from there this meditation would be known as kel’no’reem. Chris also said that while he loved being on Stargate it’s time to move on and the chances of a new show or film with the original team are very remote now. The David Warner talk was incredible. I had never met David before and I was not sure how he would be as a guest. Being a Star Trek fan I of course knew David from Star Trek V, VI and of course my favourite two part story from TNG “Chain of Command”. However, those are only a few of the roles that this great actor has played. I loved him as Jack the Ripper in the time travel film “Time after Time” (directed by Nick Meyer; anyone heard of him?) with Malcolm McDowell. During the talk David was very aware that there were some members of the talk audience who may not have see his earlier work and would only speak about those roles for a short time. David spoke about how he has grown tired of playing the “bad guy” and which roles he would not feel comfortable playing anymore including those who may be suffering from age related conditions. David also spoke about being on Doctor Who and playing the Doctor in the Big Finish audio productions. When a Star Trek question was posed it made him laugh since the question asked was about being directed by William Shatner in Star Trek V. It seems this is one of the most popular questions he is asked about his time on Trek. David was very diplomatic, he explained that he was not aware of the conflicts within the original cast and found Shatner to be a competent director. When asked; David said he preferred his role on Star Trek V since he had to wear no makeup. You really can’t blame him…..
Later that day I had an autograph from David and we spoke briefly about Star Trek. He was also very kind to record a bumper for Visionary Trek. He really is a great guy and even mentioned “four lights” when we recorded. My only regret is that I did not take a picture of me with David at his signing table. I am really kicking myself for that. The photo with David was also a highlight for me, he remembered me from earlier in the day (which was really nice) and I don’t think it looks too bad. As well as the stars of film and TV I love comics. Attending the convention was artist Mike Collins who has drawn not only Star Trek but also Doctor Who. I introduced myself to Mike and explained I had a message for him from comic writer Scott Tipton. I had recently interviews Scott for the Holodeck podcast and mentioned I was going to meet Mike, he asked me to send his regards and that he would be in touch soon. Mike was really nice; we arranged to talk about an interview for the show and he gave me an autograph including a small picture of Matt Smith. I also spoke to from Geeky Kids Comics. They first came to my attention last year at LFCC in July where I spoke to them about being an independent comic company. I was really excited to see that the first issue of Esimee was out. This is an interesting twist on Vampires and has Jack the Ripper in the story. 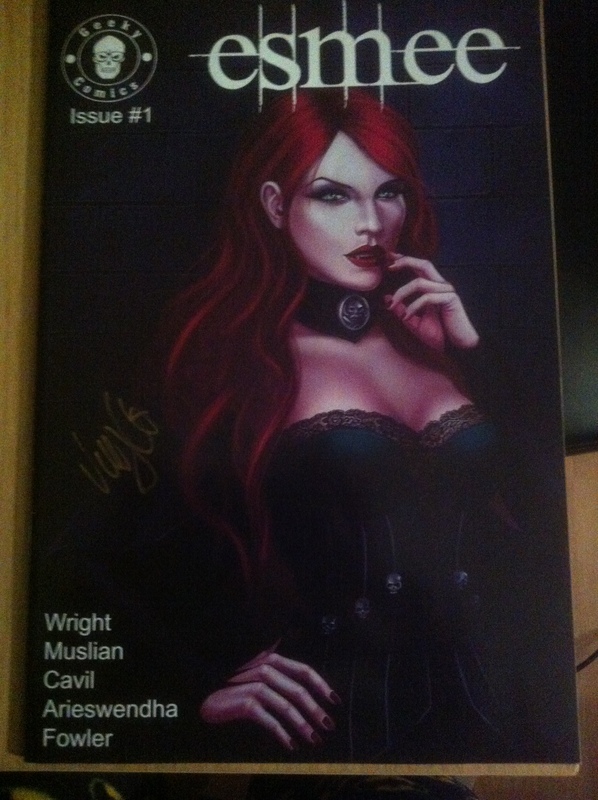 He told me about his plans for the comic, how he intends to bring more elements of Victorian England in to the story. As well as Esimee he also has a number of titles out which again all deserve a look. We have arranged to contact each other to record a show discussing being an independent publisher and all the great titles he has written. 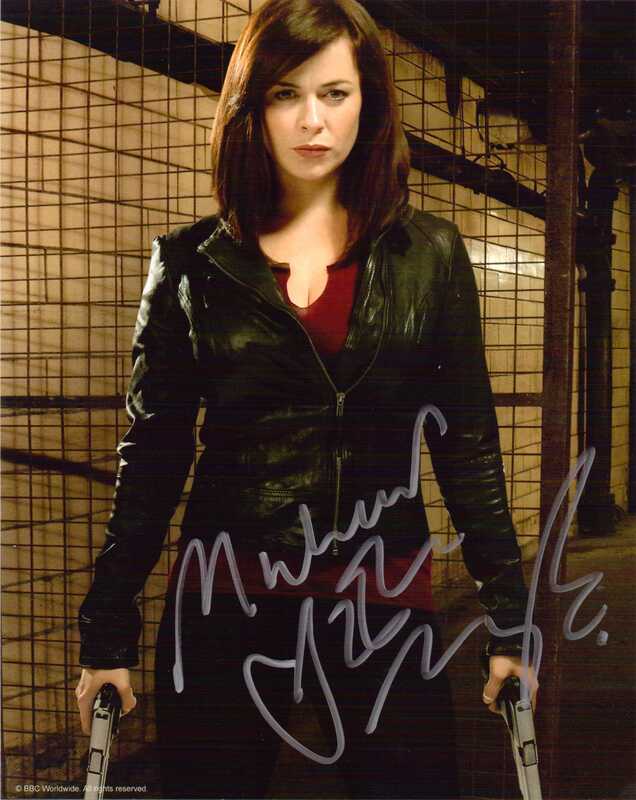 I ended the first day with taking advantage of there being a small queue on Eve Myles autograph table. 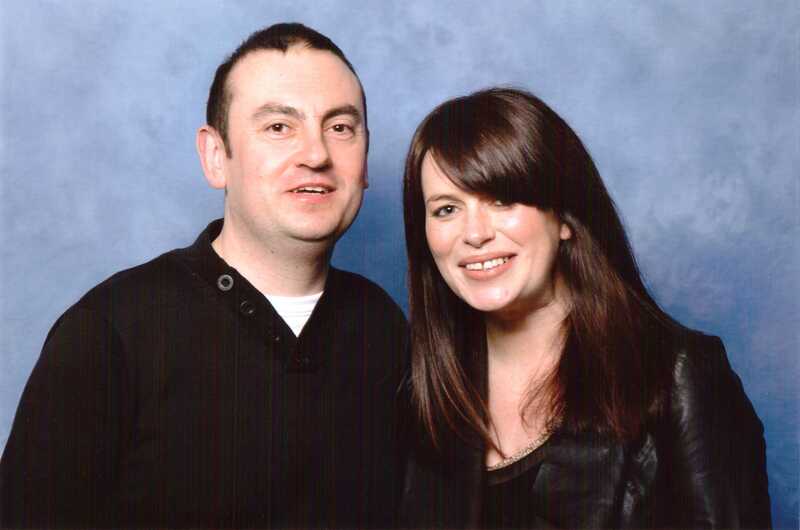 Now, Eve Myles is amazing. Ever since appearing in Doctor Who I have really liked the actress and in Torchwood & Frankie Eve is brilliant. Eve was really nice, we spoke as I spent ages deciding which picture I wanted signed and I mentioned I was looking forward to her talk tomorrow. Day two began with a surprise. Most events I have attended seem to have a lower attendance on the Sunday but this was not the case. While I don’t have the official figures I could tell it was just as busy as the Saturday with queues around the block. I can see this event being on the calendar for some time to come. I then had a nice look around all the stalls. I really do enjoy all the merchandise that is on sales at these events. Some were familiar to me from previous events but there were quite new ones as well. I am really glad that Show Masters have all these vendors at these events, apart from the internet it would be very difficult to find some of these items and I am quite old fashioned and like to look at what I am about to buy. 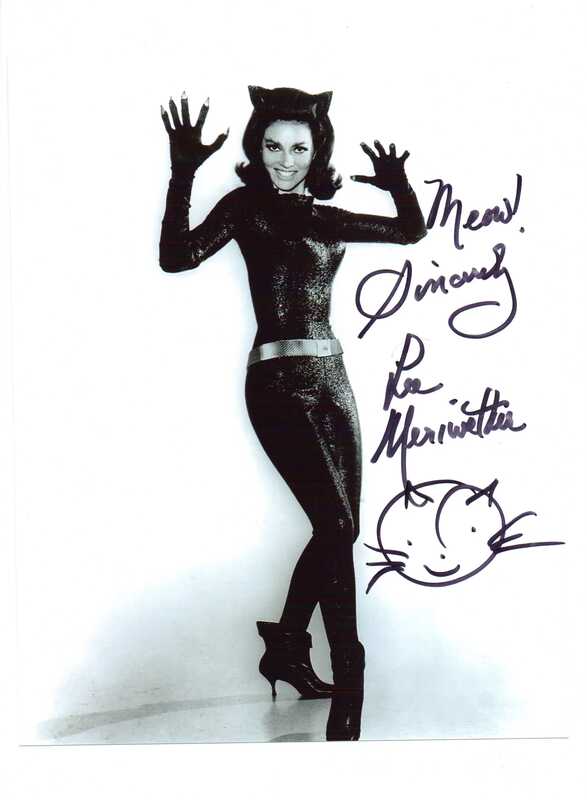 I went back to see Lee Meriwether in the morning. As well as my own autograph I also brought one for a friend however, the picture was missing a foot. It was from publicity still from the Batman series. I brought another one and Lee was very gracious to sign it again after recognising me from the day before. Lee was surprised to find her foot missing and even apologised which was really nice of her. The first talk of the day was a Doctor Who talk. On the panel were: Sophie Aldred, Caitlin Blackwood, Sarah Sutton and David Gooderson. This was a shortened talk for some reason so there was no time for questions from the audience but the panel spoke about their auditions for Who, which Doctor they enjoyed the most and what they knew about Who before joining the show. There was also a discussion on Big Finish audio productions; they even had talk planned for later in the day. What stood out for me from this talk was Sophie Aldred. She really connected to the audience, had some interesting stories about her time on Doctor Who including how Sylvester McCoy took her under wing. The next talk and the highlight of the whole weekend for me was the Eve Myles / Kai Owen talk. The chemistry between the two was incredible. Eve is so full of energy, from the get go she was laughing and joking while Kai was just egging her on. It was something to see. Instead of the standard format talk they both took questions from the beginning. There was a question about “Frankie”, the series Eve starred in. Like us (I love this show) Eve was shocked that it was not renewed and spoke about how she was always dancing like Frankie in real life. Some good news was that her recent series with Anthony Head had been renewed for a second season. Kai spoke John Barrowman, how it was always crazy being on set with him. They told us am interesting story about John’s “balls” and I think I will leave it at that…. Something that stood out from the talk was the huge amount of pride both felt towards the Welsh film and television industry. They spoke about how much television is now filmed in Wales, how both Torchwood and Doctor Who has helped towards this. They were also both excited about the convention being held in Cardiff. There were a few screams about that and Eve mentioned how great it was when signing to have so many people ask for autographs with a Welsh accent. The conversation moved towards Torchwood where they both felt each series was special for different reasons. They did enjoy “Miracle Day”, who wouldn’t enjoy being shipped out to L.A for six months with their family to work. They would both love to see the series return but that decision remains with Russell T. Davis and the B.B.C. Eve also mentioned her love of Buffy with the room erupting with that announcement. Both left to standing ovations from the audience. I promised myself then that I really do need to attend another talk with Eve and Kai again. That afternoon I had my photo shoot with Eve. What an experience that was. Eve had music playing and in between photos Eve was jumping, screaming and having loads of fun. When it was my turn we were talking about her talk and we had to be asked to stop talking by the photographer so that he could take the picture. That was priceless. That was the most time I had spent when having my photo taken. 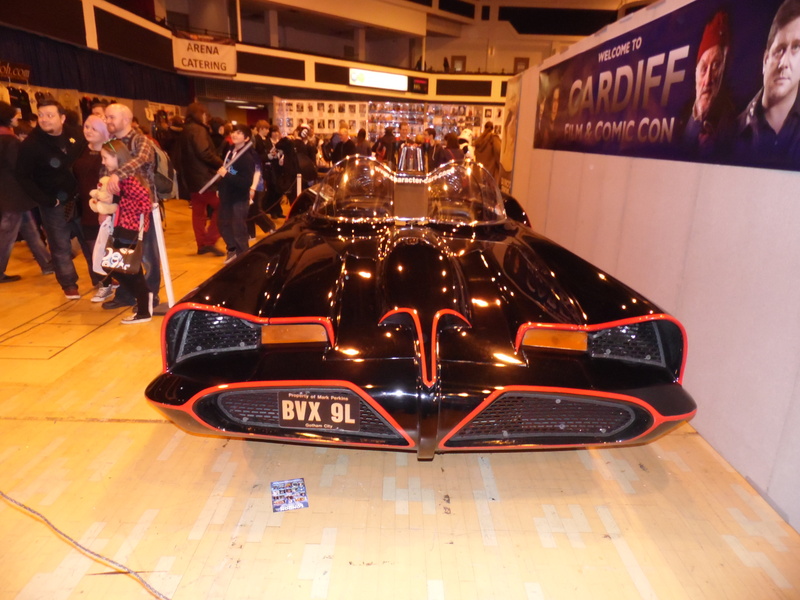 The rest of Sunday was spent wandering the halls, looking at all the great Cosplayers and dreaming of driving home to London in the Batmobile…. Overall I really enjoyed the Cardiff Film and Comic Con. Having only experienced the London Film and Comic Con and Collectormania it was really nice to see the event in a different location. As mentioned I thought the layout of the show was really good, I thought the mixture of guests was good and I really enjoyed the comic areas. The talks were amazing and having them away from the main hall really made a difference in terms of enjoyment for me. The lighting for me was frustrating as all my pictures have a tint of yellow to them but perhaps I need a better camera. I would certainly consider coming to Cardiff each year for this event. For me Cardiff was all about Eve…. Look out for the special Visionary Trek – Off the Record pod where I get to talk more about the event with Bunny and see below for the links to Show Masters and Geeky Comics. I also want to thank Show Masters for the press pass and the support they have given me in reporting this event. For more about Geeky Comics check out their Facebook page. For more about ShowMasters check out their website. I cannot believe we are in March! Where did January and February go? I wrote this while on the train to Cardiff for the Cardiff Film and Comic Con. There will be more about that soon but it hasn’t escaped me that’s it’s been nearly three months since I have written anything for my blog. I am sure if I concentrated enough I could come up with a hundred and one reasons why I have not written anything but truth be told I need to be more disciplined with myself. I really do enjoy writing and my blog is my way of expressing how I am feeling, what’s been happening and a good way for me to reflect but more importantly to grow. My aim is to write one piece per week. Let’s see what happens. Here’s a quick recap on what’s been happening over the last couple of months. The podcast I have been working on with Bunny, Laura and Jon has finally launched. Visionary Trek explores Star Trek; looking at themes (such as the captains’ of Trek) and where possible we use those themes to cover all the various incarnations of Star Trek. We have now released five shows since January and we are releasing two per month. As well as that The Holodeck is still exploring Star Trek in comics and also launching is the Captains’ Table podcast where I get the chance to talk to Star Trek authors. All three shows are great and are worth a listen to. Bunny, Laura and I host Visionary Trek while it’s Bunny and I on the Holodeck. On the Captains’ Table you will find Roz and me with Sina popping in from time to time. We have a great website where you can find the latest Trek new brought to you by Jon and some excellent reviews from Eric. Take a look and let me know what you think. Visionary Trek is great fun but is very demanding. Time management is really important considering I am juggling three shows. I think however, that we have a good process in place to review, improve and grow which is important for something of this nature. It’s really great to be podcasting again and I had missed the whole podcasting experience. We have some great things happening over the next few months and I am very excited to be a part of this adventure. Away from podcasting I have been planning my convention attendance for this year. As you know I have really caught the “con bug” and this year looks like it’s going to be a great year. Over the course of the year I am going to be travelling to Cardiff, Wrexham, Glasgow, Milton Keynes and Germany which will be my first convention abroad. I am going to the Fedcon convention with Bunny in May. Look out for more about these during the course of the year. Work is still going well. I know retail but it would be nice to move out of the sector or find an administration role within retail. My work has been very flexible with my convention dates so it’s not all bad. I spent a great weekend with Bunny and Laura in February. Bunny and I went to visit Laura in Milton Keynes. We had a great meal together, went bowling and of course shopping. It was a lot of fun and it’s nice to meet up without the need to podcast or rush around at a convention. 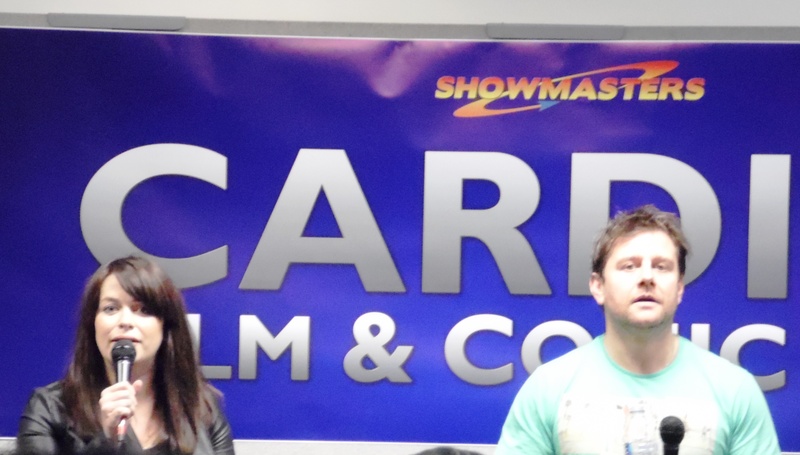 Look out for my thoughts on the Cardiff Film and Comic Con very soon. Take a look at Visionary Trek here.